This article was first published in ‘Family Tree Magazine’, in 2010. It tells the story of two of my ancestors – Sgt James Brumby, and William Potter. One was a law abiding marine, accompanying the Third Fleet convicts out to Australia in the 1790s and the other – one of my ‘favourite’ ancestors, although he is a bad lad, was William Potter,the incendiarist. Potter got a death sentence in 1844, although he never held the match in his hand. Today, I’ll give you the half of the article about Potter. Brumby is quite a famous Aussie and I’ll tell you about him another time! I found more than I bargained for when I uncovered reports of my great-great uncle who, as a teenager, was sentenced to death and then sent to Australia. Another family relative, this time more law-abiding, also ventured down under where his name lives on today among the wild horses that roam there..
At York Assizes, Friday, William Potter, 20, jobbing bricklayer, was found guilty of setting fire to house of Wm Neville of Wistow, and sentenced to Death… learned Judge adding, “that his mortal doom was fixed”, and imploring him to “throw himself on the mercy of Him whose mercy had no limit if his faith was sincere”… Jackson’s Oxford Journal, 14 December 1844. I admit I had always secretly hoped to find a convict ancestor but coming from a long line of Yorkshire farmers it seemed a vain hope. A great resource for family historians is the Gale British Library of 19th Century newspapers which can be accessed online from home or at the library if your branch has subscribed to the service. During my search I stumbled on the story that would give me ‘my’ convict and it turned out to be no ordinary case – but one that hit the headlines. The Hull Packet newspaper, describing the 1844 Yorkshire Winter Gaol Delivery, reported that two of the inmates to be delivered were William Potter and Thomas Golton, my great-great uncles. My grandmother was a Golton and I knew every Golton/Goulton in Wistow, Yorkshire was related to me so I realised immediately I had found a connection. 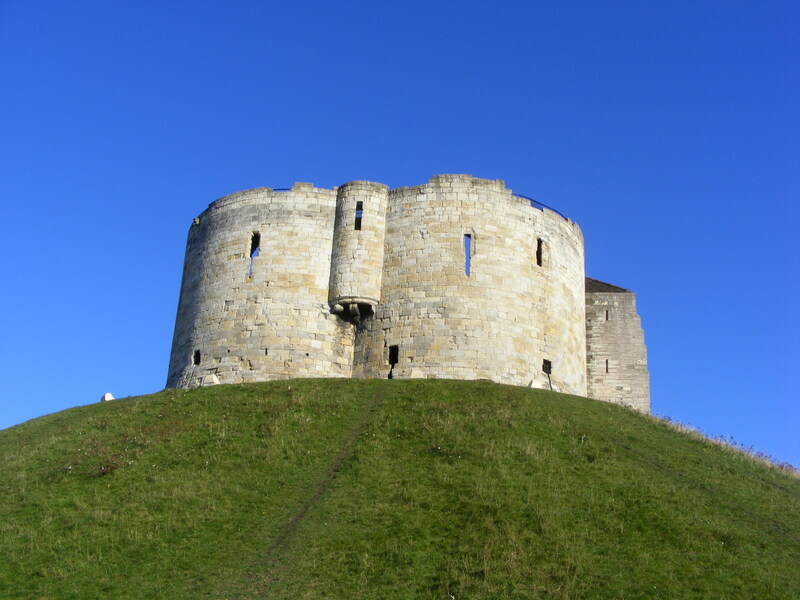 Nineteen-year-old Potter and Golton were delivered to York Castle jail for incendiarism. When I read accounts of the trial, only Potter appeared to be standing trial and it took a while to find out why. The record of Potter’s marriage to my great-great aunt, Sarah Golton, in Wistow parish records stated Potter was under-age and a bricklayer. Church Fenton parish records told a different story to the newspapers. Potter, born 12 November 1826, son of bricklayer John Potter, married Sarah Golton in the summer of 1844, when he was only 17 years old and Sarah was 22. He committed the crime around the time of his 18th birthday. The crime was a strange one. First, the lads burned down farmer William Dixon’s barn, around midnight, and he lost his uninsured crop of barley and two foals. Then they set fire to the thatched eaves of farmer William Neville’s house. Neville’s family of five young children, his wife, and his aged father managed to escape uninjured and the fire was put out. Golton had the Lucifer matches in his hand, not Potter – and it was Golton who had set fire to both buildings. Golton turned Queen’s Evidence (see below), and his testimony resulted in Potter being sentenced to death. Potter was condemned ‘with no hope of mercy’, according to the judge’s summing up. The only explanation offered for the crime was that as a bricklayer wanted to get the job of rebuilding. The judge summed up that ‘it was the most serious case of the kind he had ever known’ and also remarked that, as the law stood, even setting fire to barns not attached to farm houses, as in the case of Dixon’s barn, carried the death penalty. Justice Coleridge reluctantly passed the death sentence and Potter remained calm and unmoved. The judge remarked that he was uneducated and godless; society’s fault, not Potter’s. Golton, arguably the more guilty of the two, walked free. On Christmas Day, 1845, the sentence was commuted to transportation for life. I tracked down the original handwritten 1844 gaoler’s journal in York Reference Library. The gaoler laconically noted: ‘25th December. Rec’d a Respite for William Potter a prisoner under Sentence of Death’. ‘Sent 12 Male Convicts to Millbank Prison’. It’s likely William was one of these as he was the only lifer. He would have been held in the London prison before being transported. During their final days in England, the convicts often sent word to their relatives and friends. Some smuggled in money in the bottom of inkwells. We have no way of knowing whether Potter was still in contact with Sarah, or knew his wife was expecting a baby, two hundred miles away. I had not only found ‘my’ convict, but he seemed to be at the centre of a controversial case, one that started to sway public opinion against capital punishment 100 years before the movement gained momentum. There are 79 prisoners for trial at the castle… of the 79… there are 39 whose education is deemed to be imperfect… 24 can neither read nor write… Yorkshire Gazette, 30 November 1844. Although the judge had remarked how uneducated and godless Potter was, his marriage certificate tells a slightly different story. He could sign his name, and it looks practised. If they had known he was only 17, would he have received more sympathy? As genealogists, the original documents we look at sometimes contradict the public record. Potter was taken from York Castle to Millbank, awaiting the next convict ship. Millbank Prison in London was used for convicts until 1886 and demolished in 1890. William Potter was believed to have spent time here before being transported to Australia. Potter sailed on the David Malcolm in the summer of 1845, and arrived on 25 August. Tasmania has digitised many records which are freely available and searchable online. You can search by convict name, and/or record number. Some convicts left quite a paper trail – tickets of leave and conditional pardons were recorded, also a convict’s conduct and applications for permission to marry. Not all Australian records are so accessible and not every state has digitised its records. I could piece together a lot of information about Potter from the Tasmanian convict records and also from information on the website of the Society of Australian Genealogists (SAG). Potter’s conduct record shows the date of his trial at York Assizes, his conviction, and then the various conduct offences he committed whilst a convict. Better still, there is a description. He was 5ft 5ins, with a sallow complexion, broad head, brown hair, dark eyebrows, hazel eyes, a small nose and he came from Church Fenton, which confirmed he was indeed the William Potter I had found in the parish records. Potter’s description raises an interesting question. In the space for distinguishing marks, it says ‘scar left ear’, and yet, of all the many newspaper accounts I read, only the Liverpool Mercury, dated 13 December 1844, describes him as: …a youth of nineteen, whose face was frightfully disfigured with cancer… It seems odd that a detailed description of Potter, only a couple of years later, makes no mention of disfigurement. Potter’s conduct record also survives. While in custody, he had ‘used obscene language’ in chapel for which he was given 10 days in solitary confinement. In December 1853, in Hobart, he had ‘communicated with female persons’ and assaulted a constable for which he got six months’ hard labour. He was in trouble again in February 1855 for disturbing the peace but this time he was only fined. In April 1857, he was granted a conditional discharge. As a lifer, he was not entitled to return to England and although some lifers sent for their families, Potter did not. He applied twice (in 1853 and 1854) for permission to marry Mary Spencer, a prostitute convict. Soon after Potter sailed, Sarah gave birth to his daughter, Ann Alice. Sarah could have applied to join Potter as a free settler but she didn’t. And yet Potter’s name wasn’t entirely forgotten back home. Ann Alice’s wedding certificate, 20 years later names ‘William Potter, bricklayer’ as her father. If I had found that innocent-looking document before knowing the story behind it, I would have had no idea that the man named on the certificate was a man she had never met who lived on the other side of the world. There is no trace of Sarah after the 1851 Census and I have not managed to find a burial or marriage record for her. Potter was granted a conditional pardon in 1853. Within 18 months of the court case, Thomas Golton had died. The Nevilles forgave us Goltons, as my grandparents married in 1923, uniting the two families. My mum’s cousin was a Neville whose grandfather was one of the infants in the farmhouse on the night of the fire. It is worth remembering that if your Aussie ancestor was military, he may well appear in the British Army records at Kew. I was lucky with both Potter and Brumby as one was involved in a widely-reported case and the other was a settler who was well-documented. For your ancestor, transportation to Van Diemen’s Land was the worst news possible but for genealogists it’s the opposite – researching a Tasmanian ancestor you can strike gold! ! And that is where the Potter text of the article ends. But. There’s more. Since writing, I discovered more detail. It does now seem likely my instinct about Thomas Golton being let off the hook due to cancer, might have been on the money. All along, I hadn’t bought it that Potter was the one with the cancerous face. And, if that was confusing the two lads and actually, that was Golton – that might go some way to explaining why he held the match but walked off scot free. [The Bradford Observer; and Halifax, Huddersfield, and Keighley Reporter (Bradford, England), Thursday, December 12, 1844]. The Bradford Observer – which had not been accessible at the time I wrote the article – proved to be a goldmine of information. Not only expanding on the erroneous hint I’d found in the Liverpool newspaper about Potter’s supposed facial disfigurement, but also because it expanded, unlike the nationals, on the evidence Potter gave in the stand re. that key issue – motive. …. Prisoner went home, told all he had seen, and they [the Goltons] replied that if he told they would have his life by night or by day. The prisoner proceeded with further detail to show that his wife’s family were set against him, and that they had induced his brother-in-law to swear these facts against him…. The Hull Packet and East Riding Times , Friday, December 6, 1844. My great-great uncles remained vague and conflicted about the actual motives for the attack – it was the lawyers who postulated that maybe the motive was that Potter could get work out of any rebuilding. I would happily buy into that, having a strange soft spot for Potter – if it weren’t for the facts that the Goltons were comparatively respectable. They had a higher than usual count of illegitimate births in the family from the 1820s to the late 19thC, as they moved from Wistow to Ottringham, and back but on the other hand, my great grandfather, Joseph Golton, a generation after Potter, was appointed Wistow Parish Overseer – and seems to have established himself as a respectable farmer. Hard to imagine in a small village where the families stay the same for generations, and memories are long, if the Goltons truly were a nest of rogues, as Potter claimed. Either way, the simple-minded, hideous Golton was more credible than poor Potter. The Judge took 2-3 minutes to reach his verdict. Potter had no counsel, and no-one spoke up for him. My feeling is; I would not dismiss Potter’s version of events as readily as the judge did. It was his word against Golton’s. And it’s likely the Golton family disliked the 17 year old bricklayer who’d got their eldest daughter pregnant. Societal pressures would have meant Potter felt compelled to marry Sarah. But he was little more than a child, himself. His family – father also a bricklayer – would have lived in considerable poverty. I stumbled on a reference to one of Potter’s brothers being consigned to the York Blue Coat Boys’ School; a charity school for the poorest of the poor. The boy was considered to be disruptive and unruly. In the 1840s, the Potters found themselves in Cawood, the village next to Wistow. Some miles distant from their native Church Fenton; in an insular society where People like the Nevilles, the Dixons and even the Goltons, fitted in. In the 1841 Census, there are very few outsiders in Wistow. Potter had everything stacked against him. I doubt the Goltons even knew he was only 17. His riotous conduct in Tasmania could be down to an inherently awkward, diffucult nature. But it could also be down to the anger of an innocent man, condemned forever to live in a place that was widely regarded as hell on earth. Van Dieman’s Land was the most dreaded convict destination of all. Re. motives… I have another theory. 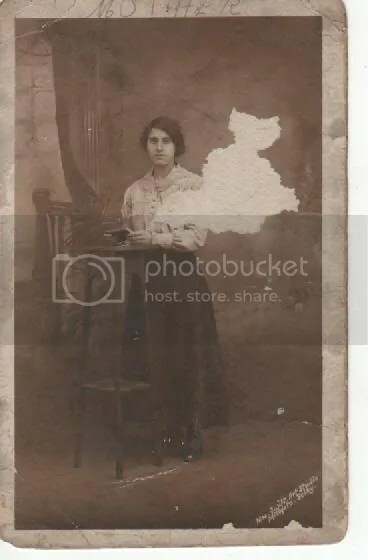 My mother’s cousin, the lovely Miss Ella Neville, had a facial disfigurement that one Cawooder told me her father, George Neville had also had – it was a severe condition that easily could be mistaken for ‘cancer of the face’. George Neville’s father was one of the children inside Neville’s thatched farm-house, that night in 1844. 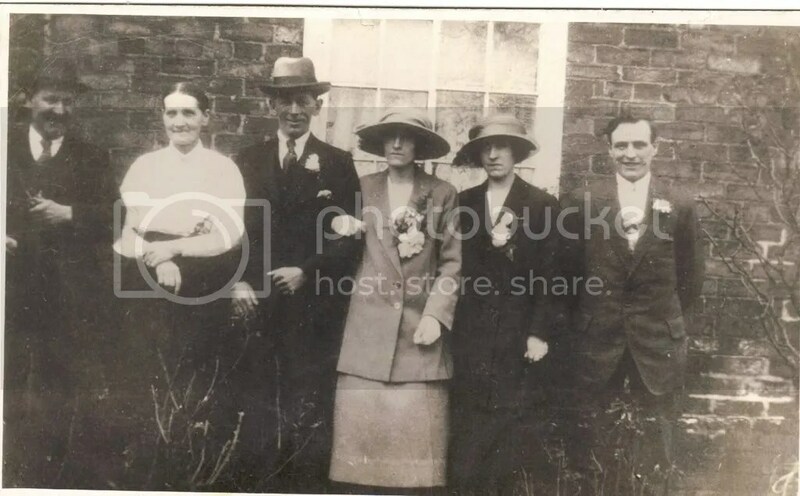 The Nevilles were not to be formally related to the Goltons until the marriage of my grandparents in the 1920s. But since discovering this case, I have wondered whether there wasn’t some blood connection between the two, sooner than the 20thC. This might explain the bad blood between Potter; an outsider to Wistow, trying to fit in with the Goltons, living with Sarah under his father-in-law, James Golton’s roof, and the Nevilles (whose burning farmhouse was visible from the Goltons’ cottage). Pure speculation but that was my instinct, all along.